Dry January – You’ve got to be Kidding!!! Even if we discount NYE, we still managed to pack in a few parties in the rest of January, whilst on Martinique. So here’s how it unfolded…. After recovering from NYE sufficiently well to plot a course to Martinique, off we went from Barbados and had a wonderful sail on a very nice 90-degree reach – so much so thst we just took off and we ended up going far too fast – so half way across we had to reef the mainsail, and once that didn’t do the trick, furl in the genoa all the way in. And yet we were still too fast. 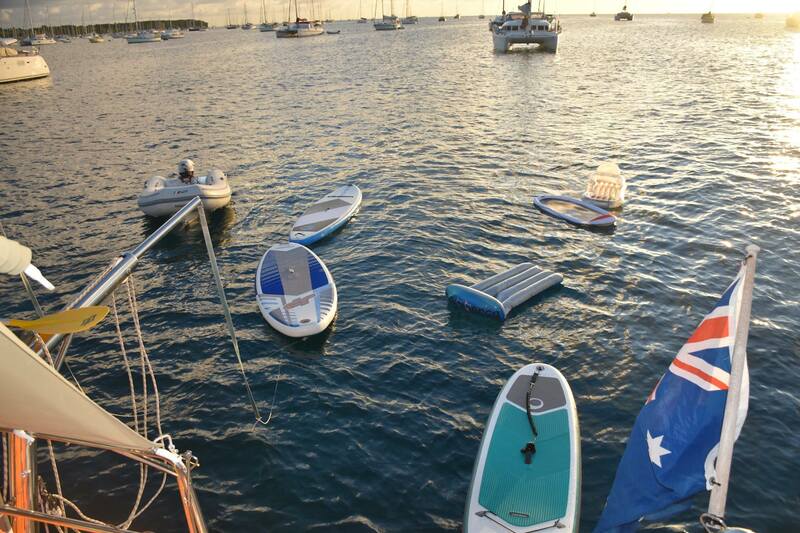 We ended up having to loiter to the south of Sainte Anne until daylight fell and we were able to motor in and anchor amongst what seemed like a thousand yachts. Still with all those yachts it was not especially crowded and we were able to pick an anchor spot from numerous possibilities in 3-4m of water. The trick to St Annes is to anchor at the Club Med end as the water is far clearer up this end. St Annes is a really cute town with a nice dinghy dock – a great place to meander around. Then it was into the dingy and off to the marina in Le Marin, a few miles around the corner and into the bay. It turns out we could have checked in using a computer terminal in Sainte Anne but I needed to find Hubert from Net-Boat who was the lagoon agent to get ourselves organised to get things fixed. The check-in in Martinique is dead easy so we could go in the next day to Le Marin Marina and get things fixed. The marina is really nice and really big and quite economical at 44 euros a day for us. The water maker pipe that burst was located and fixed, and our hull leak was re-glued and screwed. Interestingly it was the result of using round fenders rather than cylindrical fenders on the wall in Fogo. With the seam of our boat (between the hull and the deck) one third of the wall down, these round fenders tend to push the hull in too much and split the seam. Learn something every day! We also serviced both our guest toilets with new seals and O-rings and fitted a new kitchen faucet. We also blew some boat dollars at the numerous chandleries. A good service centre as well. A very productive stop. As well as working we also had some time to play, spending a wonderful Wednesday night listening to a jam session in the Marina bar as musicians and singers came and went singing Blues, Jazz and Reggae. Fantastic. We also caught up with lots of the B50 rally boats who all seemed to be in Martinique when we were there. Marina work finished for the time being (we had to return when the rub rail replacement came from France), we went out and anchored in the bay so we could use the dingy dock at Leeder Price to do some provisioning – mainly just champagne for Dee’s birthday week. 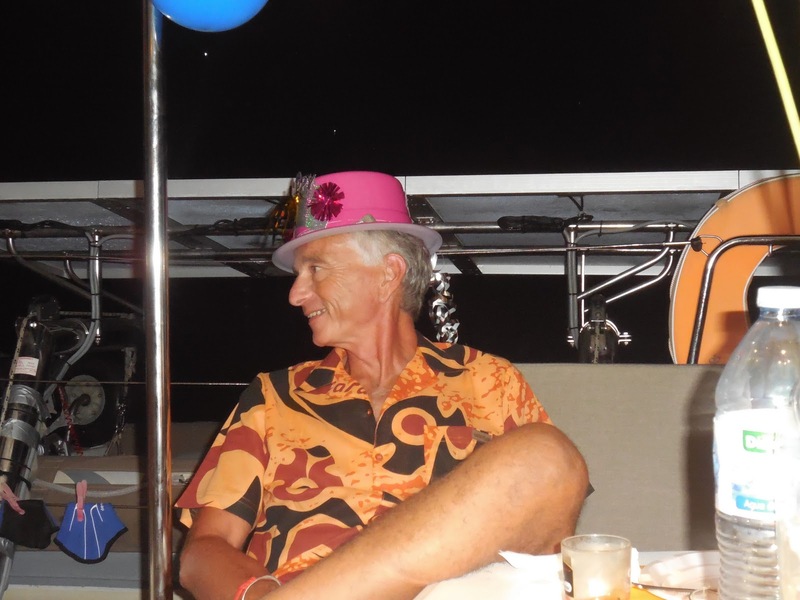 Then it was off to Sainte Annes again to catch up with Aura and their French friends, Gilbert and Isabelle, who in no time at all had invited us onto their Lagoon 450 for a wonderful dinner along with 4 of their other French friends plus Kim and Simon. Their hospitality was exceptional and we had a wonderful night, despite my French being as terrible as ever. Next day we headed off to Grande Anse D’Arlet in preparation for Dee’s birthday at Ti Sable – a wonderful restaurant with a reggae band playing. We had a great sail between Martinique and Diamond Rock, which was at one stage HMS Diamond Rock when the British installed cannons and a fort to take pop shots at the French. 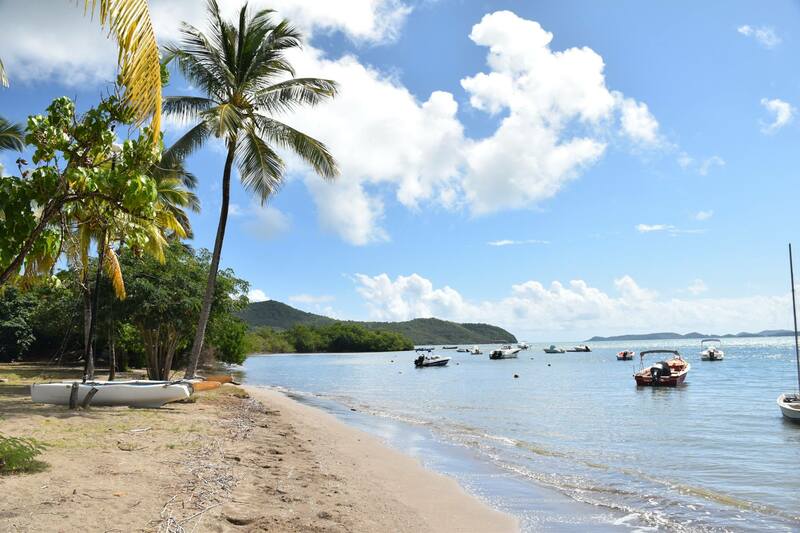 Grande Anse D’Arlet is a wonderful bay, with a great beach, dinghy dock and cutesy beach bars and shops. On our first night in the bay we dinghied over to Geoff and Linda and had wonderful drinks and a chat on the back of their boat. Next day it was Dee’s birthday and Simon and Kim duly arrived on the back of La Mischief with a birthday cake and a bottle of bubbles. Definitely a different sort of breakfast. That just about killed the morning and the afternoon was spent snorkeling and walking on the beach. We showered and went into Ti Sable about 5pm to secure a good seat for 10 with Kim and Simon. Maissie and Jinika Lyka duly arrived, as did Gilbert and Isabelle who also came in to help celebrate. Unfortunately Bill and Jade couldn’t make it because of engine issues and Ken and Jenny came up with a mad scheme to catch a ferry from St Lucia only to be foiled by exorbitant cab fares. It was a great night with great food and Reggae music catching up with old(ish) and new friends. We had big plans for the day after Dee’s birthday, but alas, Kim swam over to La Mischief and the drinking started and continued throughout the day – with lunch and a bit of swimming off the back of Aura in between. A thoroughly lazy day with Kim. Simon, Gilbert and Isabelle. It was fun to be lead astray. Come Wednesday it was back to Le Marin to get our rub rail installed. Or so we thought. We found out there was an issue with the Lagoon 421 being superseded by the new Lagoon 42 and we now needed to wait until some third party factory coughed up the necessary parts. No worries as we took a hire car around Martinique and had a couple of parties to attend to – back to back! 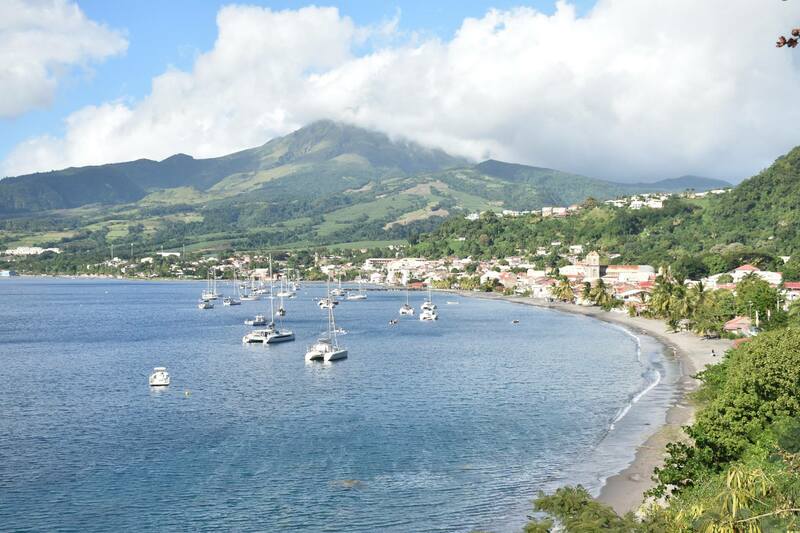 Driving around Martinique is a must do. It’s a beautiful island and only 70km long by 40 wide so very doable in a day. We called into some nice towns and beaches on the Atlantic east coast before stopping for lunch at the St James Rum Distillery and Museum, then we headed across to the Caribbean West coast via some stunning rain forest and a short stop on top of the now extinct volcano that wiped out the old capital of St Pierre, killing all 20,000 residents except for some drunk and disorderly inmate who was shielded deep in a jail cell from the 2000 degree heat that swept through the town and sunk all the ships in the harbour. We drove through the rebuilt St Pierre, now a small town and no longer the capital, along the Caribbean coast to Fort de France, the current capital, one of the biggest towns in the Caribbean. A great day of sightseeing. Then it was party time. First off the rack was Gilbert’s big 6-0 party on the back of his beautiful cat. I managed to dinghy back to La Mischief about midnight, avoiding most but not all of the rum that was being consumed into the small hours of the morning. Then I needed to back up as Sherrie from Element was turning the big 4-0 and we had a great catch-up with some old and new friends until I could stay awake no longer. There was a little bit of a lull for a few days until Australia Day was upon us. Kim, Simon and I were the only Aussies on board our two rafted up Aussie boats, but we managed to induct various French, Canadian, US, Swede, German, British and South African friends into the strange ways we celebrate Australia Day. Kickoff was at 11am and we had a very large swimming pool out the back with all the pool toys attached, the stereo going with an all Aussie play list (Cold Chisel, ACDC, INXS, Australian Crawl, etc. etc.) a Barbie with sausages and steaks, inserted into bread with caramelized onions and good old tomato sauce, washed down with beer and wine. Gourmet Australian. And to top it all off Kim made a Pavlova – how Aussie is that. Stumps were drawn at about 10:30 pm (although nobody can recall the actual time), which prompted Rob to go for a bit of a swim. Now the thing to know about Rob is he NEVER goes swimming after 3pm – something to do with sharks evidently, but there’s something particular about Australia Day that inspired him (he claims that it was not enough mixer for his rum). His swim started with a classic Back strokers start – you know where they hang above the pool off the blocks – in Rob’s case he was hanging off the side of La Mischief trying to get in his dingy that wasn’t there. Slowly this fact dawned on him, as did his limited options, so drop he did into the sea. Cathy was in their dinghy and we managed to get Rob to swim around to the back of La Mischief to the swim ladder. Brilliant. Except that Rob didn’t like that hull and decided to check out the other hull. Finding no ladder there, he decided to swim back to his boat. Well maybe he did, maybe he didn’t because it wasn’t in the direction he was swimming. The search party convened and set off in pursuit. Rob had the dinghy keys in his pocket, so Cathy rowed after him. Gilbert and I got our dinghies going in hot pursuit and Simon tried his hand at stand up comedy, alternatively paddling and falling off, in mildly hot pursuit. Gilbert managed to find Rob in the dark and steer him towards his boat and its ladder. I towed Cathy back and left her to sort out her aspiring Mark Spitz. It’s not a great Aussie Day Party unless there’s a good story to be told the following day – thanks Rob. Speaking of the following day, it began a little on the slow side. Kim brought over bacon and eggs and we added copious amounts of coffee and somehow the girls managed to find an unopened bottle of Champagne. We were still doing the rafting up thing so it was quite nice to easily wander from boat to boat. Once we’d got our s@#t together, we managed to part company and head into the Marina one last time to get our rub rail attached. Job done finally. Then it was off to Trios Islets for a couple of days. We were feeling decidedly lazy so we just went with the Genoa and no main and managed to do 5-6kts for most the way until the last bit where it was on the nose and we motored into a strong breeze. We decided to anchor in Anse Mitan because it looked the most protected but we later agreed that Anse A L’Ane was the cutest little village with a really nice beach and that would be our recommendation. The next day it was blowing its t#ts off so we decided to take the ferry over to Fort De France and check it out a bit more thoroughly – bit of a mistake as it was a Sunday and everything was shut. Everything. So back we came and did some bar hopping in the dingy, firstly visiting Anse A L’Ane and then checking out the beach bar at a near by Hotel in Anse Mitan. Next morning it was out with the genoa only strategy for our short 15nm sail to St Pierre. We anchored in 4m and had a nice swim before checking out of Martinique, a bit confusing, as it was identical to the check in procedure using the same computerized form on a computer in a café. The café owner assured me in broken English that it was okay so hopefully it will be okay in Dominica. St Pierre has a nice feel to it with a reasonable number of small shops and restaurants. A nice final stop in Martinique. Next morning, it was up anchor and off to check out the wildly spectacular Dominica. This entry was posted in Martinique and tagged Martinique by stull61. Bookmark the permalink.